Local, artisanal, and craft products seem to dominate the foodservice industry these days, but when it comes to doughnuts, many Americans have been left to debate about which corporate giant is superior: Dunkin’ Donuts or Krispy Kreme. Until now – because specialty doughnuts peddled by a well-dressed duck could be coming soon to a city near you. Since 2006, Duck Donuts has offered made-to-order cake doughnuts decorated with eleven coatings, six toppings, and four drizzles. Customers are encouraged to choose one of each to make their own flavor designs, but may also choose from some of the most popular combinations, including maple and bacon, lemon and coconut, and peanut butter with a chocolate drizzle. Select locations also offer breakfast sandwiches and warm doughnut sundaes. 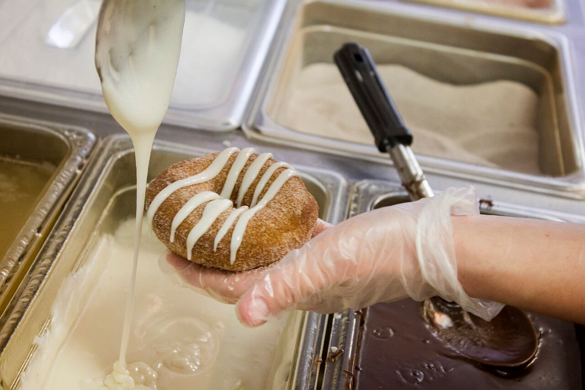 Duck Donuts isn’t the only specialty doughnut shop in America to set tongues wagging, but it may be the first that’s managed to capitalize on its fan base with a massive franchising effort. 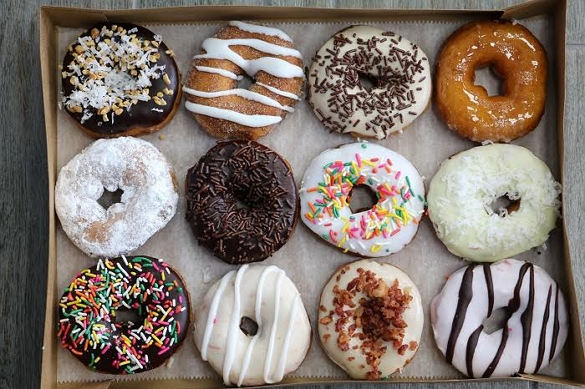 Duck Donuts opened its original locations in Duck, Kitty Hawk, and other cities on the Outer Banks of North Carolina. With the help of franchisees, the operation has grown to nearly 150 in-development and open locations stretching from Texas to New York. Russell DiGilio founded Duck Donuts and operates it with several family members, but the doughnut shop wasn’t his first experience owning a business. Russell DiGilio and family in a Duck Donuts location. 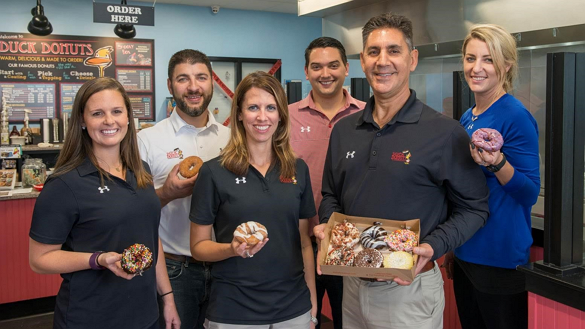 While on vacation in the Outer Banks, DiGilio realized that the Duck Donuts concept could satisfy the area’s need for specialty doughnuts. Although he didn’t originally plan to expand Duck Donuts with franchised locations, DiGilio says it became a natural next step in the company’s evolution. An assortment of specialty doughnuts from Duck Donuts. 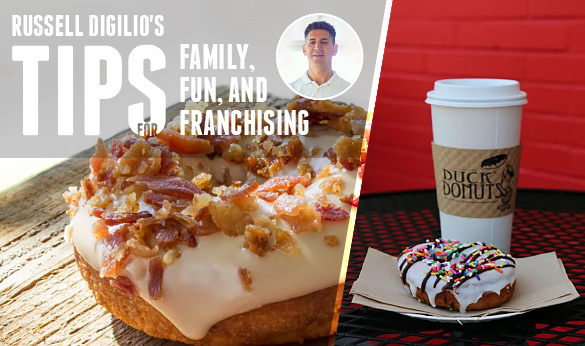 DiGilio, who sold his other businesses to focus on Duck Donuts, discussed the company’s concept and explained why folks have been flocking to try the “warm, delicious, and made-to-order” doughnuts. A Duck Donuts employee decorates a specialty doughnut.